Louis is making the first twenty-first century ride across war-torn Afghanistan, starting in Maimana. Louis knows Afghanistan well, has many friends there, and is extremely well prepared. In addition, he has been in touch with The Long Riders' Guild for a while: we have put Louis in contact with various Long Riders, including Catherine Waridel and Saskia Machaczek. Louis and and his stallion Tauruq are both buz-khazi players - the picture on the left above shows the pair riding to a game, while the one on the right shows Tauruq (without Louis) in action. Click on either photograph to enlarge it. Louis is going to use a Malibaud saddle by Aimé Mohammed. Click on photograph to see Aimé working on Louis's saddle, or visit his website: www.malibaud.com. I found Tauruq in 2002. He was a 7-year-old fierce stallion, once promised to become a strong buzkashi horse. But he had developed a light and almost invisible walking impediment at the right back foot, and I bought him just for a cheap price. We would go around Faryab hills for an early ride. I was amazed by his strength and speed. He had really good character and he never threw me off. I took care of him with the help of my friend Majid, and he became even stronger. 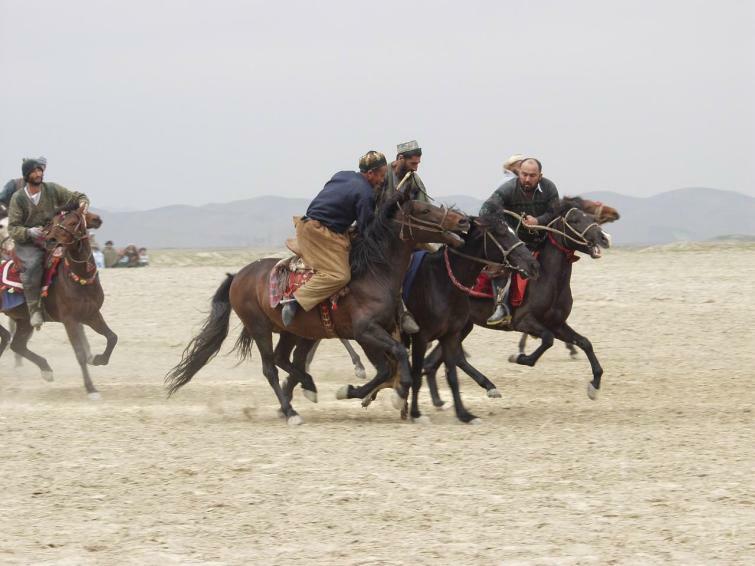 We played buzkashi together, it was our first time for both of us... I lent him to Hashem when I left Afghanistan in April 2003. I was getting news from time to time. He made an impressive buzkashi season in 2004 and became quite a legend, attracting tchopendoz and commanders attention... I last called over for news some weeks ago, and it was looking like he was fine and I could get him back for my journey. I decided to move forward with my the journey, and make it differently. The day after tomorrow I will be leaving by car to Kohistan with my guide Haji. We will spend a couple of days in Bandar and Laulash to meet people, find horses and start the journey. Haji is related to my friend Doctor Zaman, and he has good connections in central Afghanistan for he crossed the country to and from Pakistan as a Mujaheed. We will be heading to Bamyan from Band-e-Amir. Then depending on conditions we shall ride west along the Hari-rud... maybe as far as Herat. I plan to be back in Maimana in 2 months from now. For some time I will probably not be able to send mails to inform you of my progress. I received great support all along my project... from my family, from my French fellows, from friends from everywhere. I also had the opportunity to meet experienced riders who could guide me. And now my friends in Maimana are making everything possible for me... My project is now getting real, and I thank you all who made this journey possible." We wish you the best of luck, Louis - have a safe journey. "I found three horses in Bandar, Kohistan : "Mushki" or "Blacky" is a young waziri with a wild and strong character. He is thin and slim. He is not used to long journeys, and my western saddle hurts his back. Therefore he is now carrying our bags. "Danesh" is a 12 year old Mazari. I named him "Wisdom" because he is wise and calm. He is very clever with his feet and has a good endurance. I am riding him most of the time. "Chaitane" is a 8 year old Mazari. I named him "Devil" because he bites and kicks. However he is nice once someone sits on his back. He is not used to mountainous terrain but he is strong and resistant. My friend Haji rides him all the time. We left Bandar on October 14th. We rode down in a canyon to catch up with the river Murghab. In amazing landscapes we went along very narrow tracks on steep slopes above the river, which fit very well Kessel's breathtaking descriptions of Ouroz journey. We followed the river down to its source until October 20th, stopping for the night in tadjik villages. We have always received warm welcome from commanders and peasants... On October 21st we reached Hazarajat on the Koshan river. The next day we were walking along the Band-i-Amir... It was more difficult to find places to rest in this area, we stayed in mosques most of the time. We enjoyed the deep blue of the river and the varied reds and oranges of the rock until October 26th. Then we reached the 6 beautiful lakes of Band-i-Amir. We walked slowly around the water before heading to Bamyan. We are having a good rest. We will be leaving tomorrow for the Minaret of Jam. We travelled along the Murghab river for a week, on difficult and sometimes steep terrain. The welcome in this backward region, Tadjik descendants, has always been good. It is a journey in time as well as in space: I felt I was travelling in the 12th century in countryside which takes your breath away. We had to climb several peaks to get back to the plateau of the Band-i-Amir river, in Hazara country. There we found the cold and big plateaux of central Afghanistan. A few days ago we were on the banks of the Band-i-Amir lakes and today we are at Bamyan. I hope to be able to tell you more soon. In 15 days we have retraced - backwards - the journey of Ouroz, the hero of the Cavaliers de Kessel. In a few days we will head towards Herat along the Hari Rud river. There we will be following in the tracks of - again backwards! - of the German Emile Trinkler who travelled there during the 1920s. I have so much to say, it is difficult to throw all my impressions on the keyboard. I hope to tell you much more very soon. I will give you more news as soon as I get the opportunity to get an internet connection. I thank you both for your help without which I would not be here today. Click here for the latest information about Louis! Happy New Year! May 2007 bring you happiness and success in your projects and travel plans. Everything is OK in Kabul although it has got really cold. I am pessimistic about the future of the country, but security has improved as we have entered the winter truce. I don't know how long more I will be staying here, but for now I am enjoying my time. I am trying to raise funds for the Kabul buzkashi team in order to revamp the stables of the stadium and buy tchapans for the tchopendoz. It's quite difficult but it's also very exciting! I wish you all the best for this new year, a year full of travels and equestrian exploration.